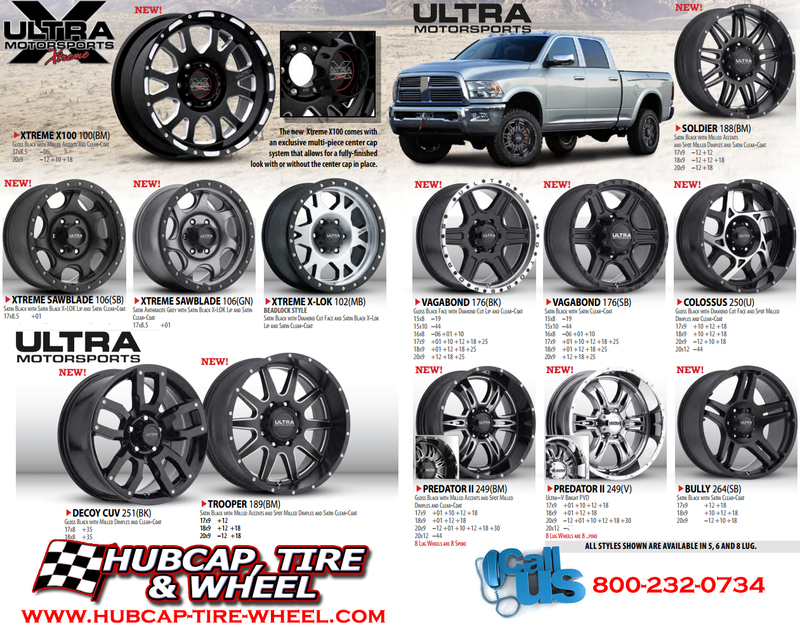 The new 2015 Ultra rims are here and there are a lot of additions: Soldier 188BM, Vagabond 176BK & 175SB, Colossus 250U, Predator II 249BM & 249V, Bully 264SB, Decoy CUV 251BK, Trooper 189BM, Xtreme Sawblade 106SB & 106GN, Xtreme X-Lok 102MB and the Xtremem x100 100BM. With so many new styles to choose from there is a lot to go through. Ultra did a fantastic job on their 2015 wheel line. They have everything for off-road use to the sleek design of the Trooper wheel that gives that look of luxury instead of off-road. In the image below I put all the new additions for this year and you go to go this page to see all the sizes and pricing. If you have ANY questions regarding wheel sizes, fitment, tire choices or anything else you can think of: please call our wheel and tire specialists and they will be able to help you out. Our wheel and tire specialists are in house ready to answer questions Monday-Friday from 8:30am-6:00pm EST and Saturday from 9am-5pm EST.